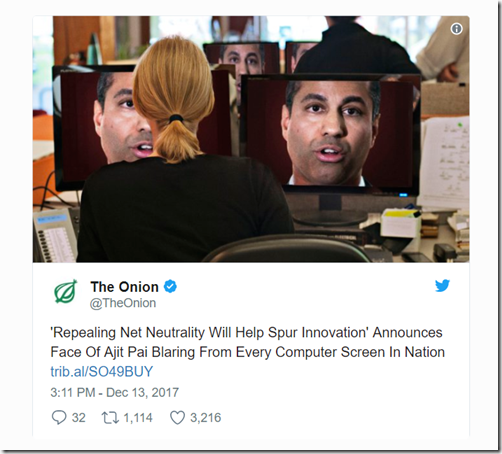 As I write this, the Federal Communications Commission (FCC) is going through the motions, live streaming its commissioners as they (mostly) express support for what turned out to be the inevitable killing of net neutrality: the 3-year-old landmark rule – imposed during the administration of President Obama – that prevents internet service providers (ISPs) from favoring some sites over others by slowing down connections or charging customers a fee for streaming or other services. …at least, the FCC had been going through the motions, until around 12:51 pm, when the room was evacuated and bomb sniffing dogs were led through the emptied room by their handlers. Commissioners were let back into the room around 1pm after it had been cleared by security. Within minutes, the room, the internet, and the telecom industry had also been cleared of net neutrality. There has been much gnashing of teeth. Clearly, this has been a contentious few months of debate: on one side, telecom giants like AT&T, Charter, Comcast and Verizon have been urging the repeal, which was put forward and championed by Republican FCC Chairman Ajit Pai. They view it as a major victory that will peel back what they see as onerous government regulation. 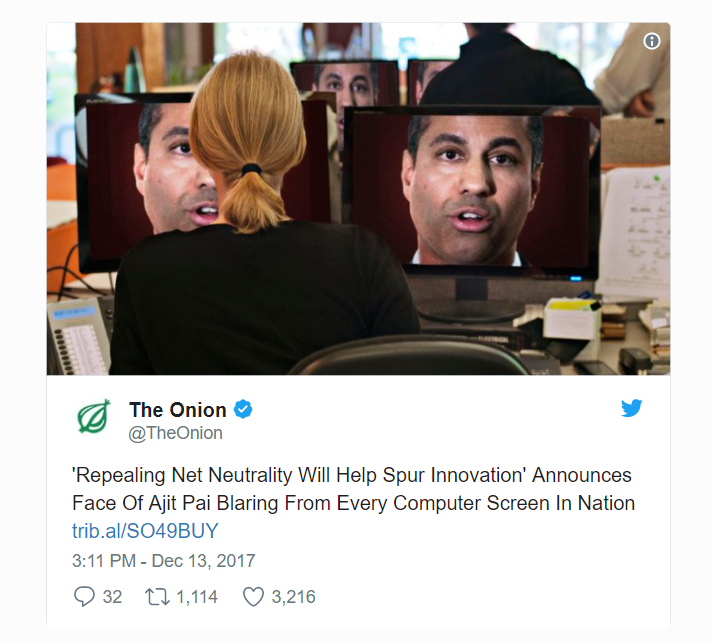 Since Net Neutrality was adopted, investment has remained consistent. During calls with investors, telecom executives themselves have even admitted that Net Neutrality hasn’t hurt their businesses. Drive up prices for internet service. Broadband providers could charge customers higher rates to access certain sites, or raise rates for internet companies to reach consumers at faster speeds. Either way, these prices hikes would be passed along to you and me. Give corporate executives free reign to slow down and censor news or websites that don’t match their political agenda, or give preference to their own content – for any reason at all. Stifle innovation. Cable companies could severely hurt their competitors by blocking certain apps or online services. Small businesses who can’t afford to pay higher rates could be squeezed out altogether. No, says former FCC Chairman Michael K. Powell: that’s the rubbish. New-age Nostradamuses predict the internet will stop working, democracy will collapse, plague will ensue and locusts will cover the land. Powell says that the “vibrant and open internet” that Americans cherish “isn’t going anywhere.” Not for days, not for weeks, not for years: we’ll also still be merrily shopping online for the holidays, oversharing our photos on Instagram, harping on about our political grievances on Facebook, and asking Alexa what the score of the game is. Everything is going to be Just Fine, and the internet Will Not Blow Up. A network company makes the most money when its pipe is full with activity. The more consumers use, the more profitable the business. With new, compelling services, consumer demand rises for higher speeds. Degrading the internet, blocking speech and trampling what consumers now have come to expect would not be profitable, and the public backlash would be unbearable. Economic self-interest and the pursuit of profits tilts decidedly toward an open internet. His optimism is not mirrored throughout the internet. Senior analyst Michael Fauscette, Chief Research Officer at G2 Crowd, a review website for business software, says that letting a business self-regulate hasn’t gone well in the past, either for the businesses or the public. Neither is this struggle over. Fauscette predicts that “there will be plenty of lawsuits attempting to put the protections back in place.” Besides whatever happens in the court, there are things happening inside Congress to restore net neutrality by passing a law to protect it. On Tuesday, Sen. John Thune (R-SD) asked net neutrality supporters on “both sides of the aisle” to work with him on a legislative solution. Would such a law pass anytime soon, given the makeup of the Republican majority House and Senate? Maybe not, but “soon” might come sooner rather than later, given Democrat Doug Jones’ upset victory to become senator in conservative Alabama, plus the fact that influential Republican Ted Cruz is seen as the next conservative in Democrats’ cross-hairs. In the meantime, take your pick between alternating views of the near future: either everything will be hunky dory, per Powell, or we can all start reaching for our wallets to pay for internet fast lanes or kicking back with a beer as we get shunted onto slow lanes.